19830308. New. Ships with Tracking Number! INTERNATIONAL WORLDWIDE Shipping available. Buy with confidence, excellent customer service! 2003-06-16. New. Ships with Tracking Number! INTERNATIONAL WORLDWIDE Shipping available. Buy with confidence, excellent customer service! Routledge. Hardcover. 1138834564 Brand New, printed in english , Ready to ship, fast delivery (6-8 busienss days ) worldwide . New. 2003-06-16. Good. Ships with Tracking Number! INTERNATIONAL WORLDWIDE Shipping available. May not contain Access Codes or Supplements. May be ex-library. Shipping & Handling by region. Buy with confidence, excellent customer service! 19830308. Good. Ships with Tracking Number! INTERNATIONAL WORLDWIDE Shipping available. May not contain Access Codes or Supplements. May be ex-library. Shipping & Handling by region. Buy with confidence, excellent customer service! Routledge. PAPERBACK. 0415307708 Special order direct from the distributor . New. Princeton University Press. PAPERBACK. 0691018456 Special order direct from the distributor . New. Routledge. PAPERBACK. 0415307708 Expedited shipping NOT available. Brand New. Exceptional customer service. Standard shipping is ground. All deliveries in 4-14 business days. . New. Routledge, 2003-06-16. 3rd Revised edition. Paperback. Used:Good. Routledge. PAPERBACK. 0415307708 Brand New, printed in english , Ready to ship, fast delivery (6-8 busienss days ) worldwide . New. Routledge. PAPERBACK. 0415307708 Brand New ,Original Book , Direct from Source , Express 5-8 Business days worldwide Delivery. . New. Routledge/Viva Books, 2003. 3rd edition. Softcover. New. `Love is a force of destiny whose power reaches from heaven to hell.` So Jung advises while reflecting on `The Love Problem of a Student`, an essay contained in this volume. But it is not just love that Jung speaks of in this book. Taking as its theme Jung`s interpretation of the feminine principle in his hugely influential theories about the inner world of the individual, it guides the reader from the mythological archetype of the mother-figure to the experience of women in twentieth-century Europe, explaining along the way concepts crucial to Jung`s understanding of the personality, such as animus and anima. Many of his contentions have become the assumptions of the generations growing up in the twenty-first century. 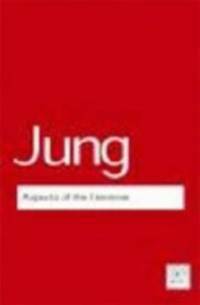 Aspects of the Feminine is a provocative, controversial book which offers readers the opportunity to discover at first hand just how radical Jung`s arguments were. Printed Pages: 224. Routledge Ltd, 1983. Paperback. Good. Disclaimer:A copy that has been read, but remains in clean condition. All pages are intact, and the cover is intact. The spine may show signs of wear. Pages can include limited notes and highlighting, and the copy can include previous owner inscriptions. At ThriftBooks, our motto is: Read More, Spend Less.Dust jacket quality is not guaranteed. U.S.A.: Princeton University Press, 1983. A clean and sound copy. Careful packing and fast, efficient shipping including delivery confirmation. Please note: International and Domestic Priority shipping for this item is available. . Paperback. Very Good. Princeton, NJ: Princeton University Press, 1983. 181 pp. Tightly bound. Spine not compromised. Text is free of markings. (1) Some mustiness from being stored in a box in a basement. The cover of this copy is white with aqua and black type face. . Paperback. Very Good. 8vo - over 7¾" - 9¾" tall. Routledge. Used - Good. Ships from the UK. Shows some signs of wear, and may have some markings on the inside. 100% Money Back Guarantee. Your purchase also supports literacy charities. Princeton, NJ, U.S.A.: Princeton University Press, 1983, 1983. Trade Paperback. Used: Good. Trade Paperback. Good++. Jung study of an archetype, 188 pages, small moisture stain bottom center of last 25 or so pages, unmarked text, no rips or tears. Princeton University Press. PAPERBACK. 0691018456 G+ Contents are tight; ink . Good. Routledge Ltd. PAPERBACK. 0710095228 . Very Good. Routledge, 09/11/1986. Paperback. Used; Good. **WE SHIP WITHIN 24 HRS FROM LONDON, UK, 98% OF OUR ORDERS ARE RECEIVED WITHIN 7-10 DAYS. We believe you will be completely satisfied with our quick and reliable service. All orders are dispatched as swiftly as possible! Buy with confidence! London and New York: ARK Paperbacks, 1986. Paper bound, first thus, v + Pp179. Spine moderately cocked else a tight, clean, very good or better copy. 170 grams - ships lettermail at reduced postage when you contact us directly! We welcome all reasonable offers on our books. All books in stock and available for immediate shipment from Winnipeg, Manitoba. Routledge. PAPERBACK. 0744800544 . Very Good. Routledge, 2003. This is an ex-library book and may have the usual library/used-book markings inside.This book has soft covers. In good all round condition. Routledge Ltd. Paperback. POOR. Noticeably used book. Heavy wear to cover. Pages contain marginal notes, underlining, and or highlighting. Possible ex library copy, with all the markings/stickers of that library. Accessories such as CD, codes, toys, and dust jackets may not be included.